VINTAGE COSTUME ANTIQUE JEWELRY MATCHING JEWELRY SETS - PARURES! Blue Sapphire Crystal Rhinestone Necklace And Dangle Earrings Vintage Jewelry Matching Set - Parure For Weddings, Proms, Pageants And Parties! 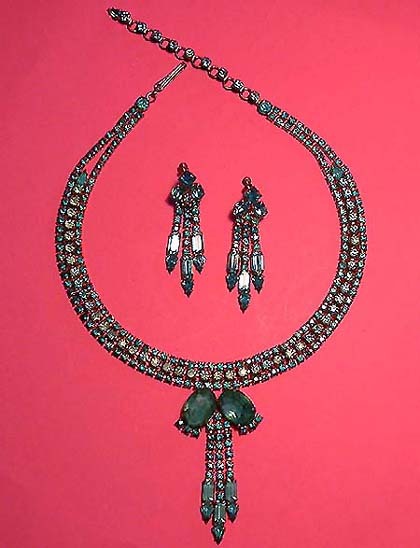 Item #S16836 - Blue Sapphire Crystal Rhinestone Necklace And Dangle Earrings Vintage Jewelry Matching Set - Parure. Size: Necklace - Entire length 18" and adjustable. Dangle Earrings - 2 3/8". If variety is the spice of life, this spectacular vintage jewelry set is hot! It features round cut, teardrop shaped, baguette, princess cut and large opal shaped crystal rhinestones of sapphire and aqua blue all prong set on goldtone! It is not signed and should have been. It is absolutely a high-end jewelry set with excellent workmanship and attention to details. It has substance and nice weight to the pieces. The necklace is 1/2" wide with 3 rows of sparkling sapphire blue and aqua blue crystal rhinestones. The middle row are aqua blue crystal rhinestones punctuated by a sapphire blue teardrop crystal rhinestone on each end. It is slightly raised to add depth and interest to the necklace. The extension is a book link accented by 10 aqua blue round rhinestones Tifany set and finishing off with a sapphire blue tearshop rhinestone. The center piece features two large aqua blue opal shaped crystal rhinestones adorned by 3 small rounds and has 3 strands of rhinestone dangles dripping down. Each dangle features round cut, baguette and teardrop sapphire and aqua blue crystal rhinestones. Each large opal shaped stone measures 3/4" x 1/2". Each baguette measures 3/8" x 1/4" and the teardrops measures 3/8" each. The magnificent center drop measures 2 3/4" x 1 1/4" and complimenting the matching dangle earrings fabulously. The screw back matching dangle earrings feature a princess cut and two opal shaped rhinestones prong set in a triangular fashion dripping down with 3 glorious strands of round, baguette and teardrop crystal rhinestones much like the center piece of the necklace. Breathtakingly beautiful! The picture cannot capture the beauty of this magnificent jewelry set. A fabulous matching Jewelry set to wear at weddings, prom nights, pageants, parties, cruises and special functions! Excellent Condition. US$238.00. SOLD. Write down the Item Number and the Name of the Jewel. Click here to e-mail me the item number, name of the Jewel, your name and address. I will hold the item for you for 7 days. Order by credit card via PayPal.